Intended to help prevent tired feeling legs. 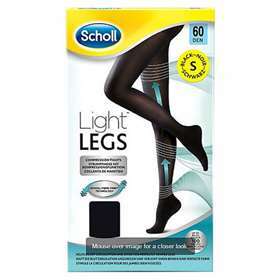 Scholl Light Legs tights are ideal if you spend a lot of time sitting, standing or in a mainly sedentary position. Light Legs tights are gentle gradient compression hosiery intended to help prevent tired feeling legs by improving venous return and to provide the appearance of toned and beautiful legs. Compression tights 4mm Hg-10mm Hg. Lasts for up to 100 washes. To ensure the tights last make sure your fingernails and toenails are free from rough edges that could snag the tights and cause ladders and holes. Remove any jewellery that could catch on the tights. For reasons of health and hygiene safety, we are unable to exchange or refund. Please ensure you purchase the correct size.